Chevrolet introduced their full-sized Suburban in 1934, launching one of longest-running lines of vehicles released by Chevy. The Suburban has gone through several redesigns and upgrades, moving from a wagon body to a more conventional full-sized SUV body. In addition to the Suburban, Chevy released the Chevy Tahoe in 1995. This model is slightly smaller than the Suburban, providing a shorter wheelbase. However, both of these vehicles are notable for their high center of gravity, presenting considerable rollover risks. The Suburban and the Tahoe are full-sized SUV vehicles from Chevy. This means that these vehicles are considerably larger than similar SUVs, with a slightly wider base in most cases and a significantly taller profile. While this offers more room for families, it also increases the chances of a serious accident due to a rollover. Full-sized SUVs, by their design, risk the possibility of tipping over on their side in a tight turn or after an accident. Because of the high center of gravity, a vehicle's top may be pushed or pulled to the side, and eventually fall towards the road. If there is enough momentum, a rollover accident may ensue, likely causing a great amount of destruction. Additionally, defects with the brakes or tires can worsen the possibility of a rollover accident, as the driver may not be able to control how quickly they take corners or be able to control their vehicle in the event that a tire blows out. Whether a vehicle rolls over due to its design or defective parts, rollover accidents are often considered the fault of the vehicle’s manufacturer. The National Highway Traffic Safety Administration publishes safety ratings on a vehicle's ability to avoid rollover accidents or prevent injuries during these accidents. 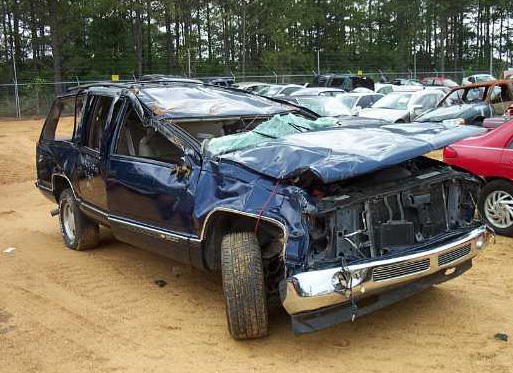 In particular, the 2013 models of both the Tahoe and Suburban only earned three out of five stars in rollover safety tests, making them much less safe in the event of an accident than other vehicles with higher ratings. Although this may not illustrate a catastrophic concern for safety, it does show that these full-sized vehicles are particularly susceptible to rollover accidents and may be more likely to be involved in a rollover accident than other motor vehicles. If your injuries or the injuries of someone you love were caused by a Chevrolet Suburban rollover accident, we may be able to help with the oftentimes complex and confusing legal process of fighting for compensation. For additional information regarding your legal options and how to pursue compensation for your injuries, lost wages, and other expenses, contact the Willis Law Firm today by calling 800-883-9858.